We are healthcare consultants with a shared vision of innovative technology advancing patient care. 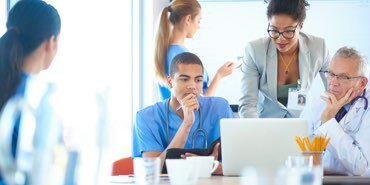 Peer Consulting provides a balanced portfolio of specialized strategic, advisory and tactical health information technology (HIT) services that offer a full spectrum of management and hands-on technical and operational assistance. As our name implies, we work side by side with you as an extension of your team to achieve your goals through the advancement of healthcare technology. Our deep expertise and collaborative approach mean shorter project timeframes and smoother business processes - for maximum results.